Cargycreevy Presbyterian Church, built in 1847. Cargycreevy Presbyterian Church choir pictured at the Harvest Thanksgiving Service on Sunday 28th October 2007. L to R: (seated) Heather McConaghy, Patricia Patterson, Beth Bell (pianist), Rev Leslie Patterson, Vera Crawford (organist), Lillian Campbell, Margaret Todd and Mary Marks. 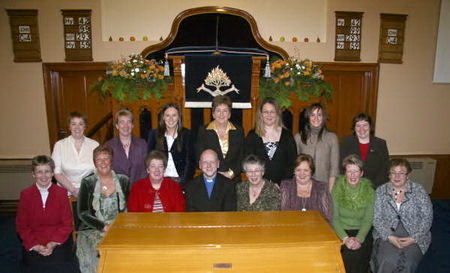 (back row) Alison Magill, Christine Petticrew, Janet Wilson, Ella McLoughlin, Hazel Maitland, Elaine Crawford and Christine McConaghy. Notice Board at Cargycreevy Presbyterian Church. 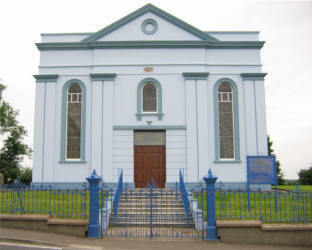 Because it was too far for the people of the Cargycreevy district to walk to the neighbouring churches, the Presbytery of Dromore agreed on 20th November 1845 to establish a congregation there and the meeting house was built in 1847. The first minister, Rev. Robert Scott Erwin, was born in Ballynahinch and was a licentiate of the Down Presbytery. He was installed here on 7th June 1846 when the services were held in a field not far from the present site. History shows that there was such a rush to be the first couple married in the new church, that the first wedding ceremony took place on Boxing Day 1847 before the roof was fitted. Mr. Erwin died on 16th February 1887. The Erwin family retained a real interest in the congregation and it has benefited considerably from their generosity over the years, a gift of £500 having been received as recently as 1973 from Miss Meryl Erwin, Australia, a great grand-daughter of the first minister. Mr. Erwin was succeeded by Mr. Robert Wilson (lic. Derry) ordained on 14th September 1887. The manse was built at this time by the same builders who had just completed one at Anahilt. Mr. Wilson resigned on 19th December 1893 when he was called to the India Mission Field. Ill-health made it impossible for him to stay there and he returned in 1922 to minister at Kilkenny and at Caledon. He died on 8th June 1931. The third minister of the Church was Mr. Samuel Murray (lic. Rathfriland). He was born at Ballyroney and was ordained here on 9th May 1894. His entire ministry was spent at Cargycreevy and he built up a fine congregation. Mr. Murray died on 4th February 1926 and was succeeded on 26th August 1926 by Rev. William Howard Colvin whose father was minister of Connor, Co. Antrim. He was called to Cargycreevy from Tassagh and Armaghbrague, Co. Armagh. Mrs. Colvin’s father, Rev. Joseph McKinstry, was the minister of the Old Congregation, Randalstown. It was during Mr. Colvin's ministry that the Church Hall was built. It was opened in September 1955 and was named the Petticrew Hall after Mr. Hans Petticrew. Mr. Colvin retired on 1stOctober 1957 and died on 11th April 1959. Mr. Thomas Samuel Reid (lic. Belfast) was ordained in Cargycreevy on 17th September 1958 and resigned on 15th April 1964 to go to Gilnahirk. Rev. Richard Diffin, who succeeded Mr. Reid, was installed on 25th May 1965. He had been brought up in the Shankill Road Mission and ordained by the Colonial and Commonwealth Mission for work in Queensland. During his ministry of five years rooms for the Minister and Choir were added to the Church, and Memorial windows were installed. Mr. Diffin resigned his charge here on 31st August 1970 and returned to Australia. During part of the vacancy which followed, Rev. Andrew Crooks, minister of Loughaghery, was appointed as stated supply in Cargycreevy, and remained in this position for a few months until his retirement in June 1971. After this, negotiations were successfully concluded for a union with Loughaghery. In the year 1971 Cargycreevy and Loughaghery congregations were happily and harmoniously united and on 23rd February 1972, the Rev. David McConaghy was installed as the first minister of the united charge. He was brought up in the congregation of Toberkeigh, near Bushmills, and served as a missionary with the Church of Central Africa Presbyterian from 1963-1971. 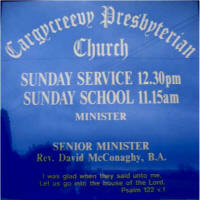 Mr. McConaghy retired on 30th April 2002 and is now the Minister Emeritus of Cargycreevy and Loughaghery. During Mr. McConaghy’s ministry a new kitchen and committee room were added to the Church Hall in 1995. Mr McConaghy retired on 30th April 2002 and is now the Minister Emeritus of Loughaghery and Cargycreevy. During a long vacancy, the Convenors of the vacancy in turn were - the Rev. 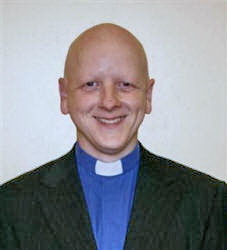 David Porter, minister of Second Dromara (May 2002 - May 2003), the Rev. Gary Glasgow, Minister of Anahilt and Drumlough (June 2003 to January 2005) and the Rev Dr Bert Tosh, Senior Producer, Religious Programmes - BBC (February 2005 - October 2007). The present minister, the Rev Leslie Patterson, formerly assistant minister of McQuiston Memorial Presbyterian Church in the Presbytery of East Belfast, was ordained and installed as minister of the united charge at a Service of Installation in Loughaghery Presbyterian Church on Friday 19th October 2007. Cargycreevy church was built in 1847. The first minister was installed in 1846 when the services were held in a field not far from the present site. History records that there was such a rush to be the first couple married in the new church, that the first wedding ceremony took place on 2nd December 1847, before the roof was fitted. The manse was built near the end of the 19th century and the church hall in 1955. During the ministry of the Rev Richard Diffin (installed in 1965) rooms for the minister and choir were added to the church, and memorial windows were installed. In 1971 Cargycreevy and Loughaghery were united and in February 1972 the Rev David McConaghy was installed as the first minister of the united charge. During his ministry a new kitchen and committee room were added to the church hall in 1995. The present minister, the Rev Leslie Patterson, was ordained and installed as minister of the united charge at a Service of Installation in Loughaghery Presbyterian Church on 19th October 2007.